The Altar Society of Mary, Queen of Peace Catholic Church is a group of women from the parish who offer their dedicated service to the Church. We are involved in the life of the Church in a very special way. Through our efforts, we assist the pastor in maintaining the nave, altar, sanctuary, and sacristy. This includes cleaning and maintaining all linens and cloths, caring for the vestments, cleaning the church, and ordering and maintaining inventory of all items needed for our church services. 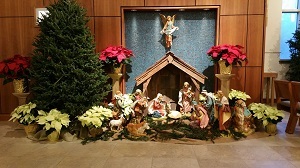 We also decorate for the liturgical seasons and care for the plants and flowers. Boys and girls in 5th grade and older have a chance to honor God through service at the altar. Servers are put on teams, which serve on a rotating basis. Training for new servers is held as needed. Parishioners interested in serving as Extraordinary Ministers of Holy Communion must attend a training session provided through the Archdiocesan Office of Worship. Permission and recommendation from the pastor is also required. Mary, Queen of Peace Ministers of the Word strive to enhance the celebration of the liturgy by proclaiming God’s living Word in a confident, persuasive and convincing manner. With the guidance of the Holy Spirit, all Ministers of the Word are focused on improving the proclamation of the Word through education, preparation and spiritual development. The Music Ministry offers a variety of opportunities for parishioners to serve at the liturgy. The four choral ensembles, the two bell choirs, and the cantor program provide enough diversity for any volunteer musician to find a comfortable place. The Usher and Greeter Ministry Mission is an integral part of the liturgy and a mission supporting the Parish Mission of Building Vibrant Catholic Community. At the center of the mission is hospitality (making the Assembly feel welcome at all times). Ushers and greeters open doors and greet the Assembly as they arrive; they are frequently the first point of contact for the Assembly. At the conclusion of the Mass, ushers and greeters open doors, hand out the bulletins, and offer pleasant farewell. o To gather and carry up the offertory gifts. o To process in an orderly fashion to receive the Holy Eucharist. Of course, ushers still take up collections.